The first details about the Black Ops 2 DLC has been leaked online and gives us a fair bit of information. The expansion pack is called “Revolution” and features four new maps and one new zombies map. That’s to say if the promotional images are accurate however. The new maps are called Hydro, Downhill, Grind and Mirage while the zombies map is called Die Rise. Along with the maps is a new gun named Peacekeeper SMG. No doubt this weapon will be used to mow down zombies and players alike. 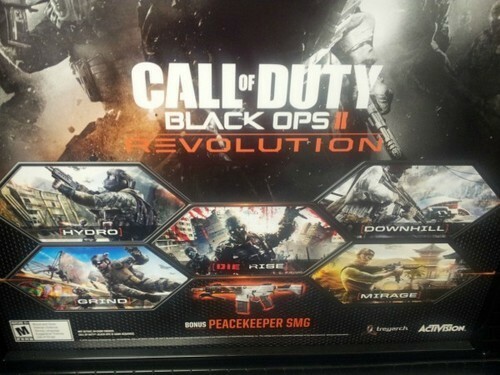 Another image claims the Revolution map pack will be available on the Xbox 360 January 29th; which is a Tuesday. What’s more is how the map pack will be exclusive to the 360 for a limited time only.